Home NutritionDiets A Vegetarian and Economical Superfoods List – My Own! A Vegetarian and Economical Superfoods List – My Own! No food, including those labelled ‘superfoods’, can compensate for unhealthy eating. If people mistakenly believe they can ‘undo’ the damage caused by unhealthy foods by eating a superfood, they may continue making routine choices that are unhealthy and increase their risk of long-term illness. Dieticians avoid the term “superfood” and prefer to talk of “super diets”, where the emphasis is on a healthy, balanced diet, rich in fruit and vegetables and wholegrain foods. It’s best not to concentrate on any one food in the hope it will work miracles. All unprocessed food from the major food groups could be considered ‘super’. All these foods are useful as part of a balanced diet. You should eat a variety of foods, to ensure you get enough of the nutrients your body needs. Sattu [roasted Bengal gram] – Excellent indigenous protein source. This ‘poor man’s protein’ as it is often referred to is not only tasty, but packed with a lot of health benefits as well. It’s high on insoluble fiber, which makes it good for your intestines, and is low on glycemic index, making it safe, and in fact beneficial for diabetics. Plus it has good proportions of iron, manganese, and magnesium, and is low on sodium too. So whether you’re watching your weight or suffering from digestion problems, a glass of sattu sharbat, or even rotis made from sattu will go a long way in keeping you healthy. And did you know that sattusharbat is also a brilliant way to detoxify the system of greasy food? It also contributes generously to the growth of muscle mass, and it’s advised that children are given about two teaspoons of sattu every day. I drank a glass of this superfood through this summer! Lemons [good old Nimbu]: Rich in vitamin C, lemon juice facilitates digestion by stimulating the secretion of bile. Citric acid helps the stomach to better flush out fat and proteins. It is also an excellent and inexpensive liver tonic. The juice of half a lemon taken on an empty stomach every morning promotes the elimination of toxins and combats fatigue. Turmeric [Haldi]: An excellent anti-inflammatory, turmeric can be used to relieve aching joints and tendinitis. It also activates serotonin, the ‘good mood’ hormone. According to a 2014 Australian study published in the Journal of Clinical Nutrition, a gram of turmeric every morning can improve the memory power of people at risk from age-related cognitive decline. The powdered root can be sprinkled on food or consumed in capsule form for a more concentrated effect. Moong [Mung]: Mung beans are a high source of nutrients including: manganese, potassium, magnesium, folate, copper, zinc and various B vitamins. They are also a very filling food, high in protein, resistant starch and dietary fiber. You can find mung beans in dried powder form, as whole uncooked beans, “split-peeled” form (just like you’d find split green peas), as bean noodles, and also as sprouted seeds (which are the kind you’d see used on sandwiches or salads).Their dried seeds may be eaten raw, cooked (whole or split), fermented, or milled and ground into flour. Because of their high nutrient density, mung beans are considered useful in defending against several chronic, age-related diseases, including heart disease, cancer, diabetes and obesity. Spinach [Palak]: Spinach is a panacea of minerals and vitamins with negligible calories. Its offerings include iron, calcium, potassium, manganese, magnesium, phosphorus, fiber and vitamins A, B1, B2, B6 and C. Further virtues include niacin (blood, brain and skin health) and zinc. Pomegranate [Anar]: Scientifically recognised for its anti-inflammatory, antioxidant, and anti-cancer properties, pomegranates also combat the effects of ageing, especially neurological disorders and Alzheimer’s disease. Another study published in the journal Nature has reported that the red fruit protects muscle tissue and boosts stamina. Nutritionists recommend eating pomegranates fresh as opposed to in the form of juice, to get the full benefits of the fruit’s mucilage, which is rich in antioxidants and fibres. Ginger [Adrak]: Excellent for detoxification. If I start listing down the benefits, I need to create one article out of it. Around 115 different chemical components found in ginger root, the therapeutic benefits come from gingerols, the oily resin from the root that acts as a highly potent antioxidant and anti-inflammatory agent. Some of the benefits includes, Nausea relief, Digestive support, Boost immunity, Reduce pain, shall I write more, oh yes, support weight loss. Lotus Seeds [Makhana]: Lotus seeds are a rich source of phosphorus, protein, potassium and magnesium. They may also contain zinc and iron. The seeds contain low levels of sugar, sodium, cholesterol and saturated fat. One ounce of raw lotus seeds contains approximately 94.3 calories. Lotus seeds also contain a powerful anti-aging enzyme which researchers are now trying to add to various anti-ageing products and cosmetics. Gooseberries [Amla]: Do you know that almost all Ayurvedic preparations contain amla. This humble fruit is known to be a rich source of Vitamin C. So much so, that one small amla has as much Vitamin C as 2 medium oranges. Packed with compounds like polyphenols, minerals like iron and zinc and vitamins like carotenes and vitamin B complex, amla can definitely keep a number of diseases at bay. Drumstick [Moringa]: It’s a kind of a new “superfood” for its highly nutritious profile and powerful anti-inflammatory, antioxidant, and tissue-protective properties among many other health benefits. It is been widely used to treat and prevent diseases such as diabetes, heart disease, anemia, arthritis, liver disease, and respiratory, skin, and digestive disorders. Moringa has become popular as a natural leaf powder supplement, although the pods, roots, bark, flowers, seeds, and fruits are also edible. As I mentioned earlier, instead of concentrating on one variety of food, we should more concentrate on healthy diet. I might not be wrong to say that “miracle food” is still a myth. 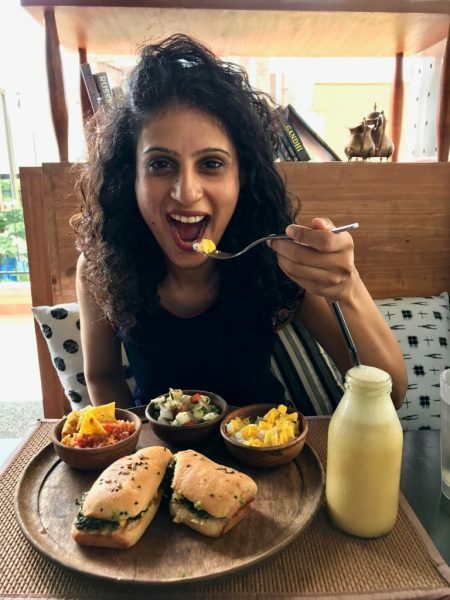 The Big Breakfast Blogger Girl! Tanya quite informative article, I would love talk to you on nutrition and yoga. Will need your help in fitness.